A warm environment for our community of teens. The perfect blend of social interaction with a dynamic Jewish twist offering opportunities for volunteering and social time. You won't just have the time of your life and hang out with friends, you will actually become an active partner in making this world a better place by giving back to the community in a meaningful way. 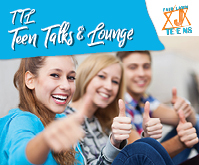 Hang out, and get connected with other Jewish teens in the area for casual, social meet and discussions.